Of course cookies are always fun to eat, but their crunchy, sugary tops make snickerdoodles even more so. Maybe I should work for the snickerdoodle industry? Since the Mexican Hot Chocolate ones were such a hit, I’ve been experimenting with different varieties for my next cookbook, and these are a favorite; an enticing spin on classic cinnamon snickerdoodles, livened up with chai spices: ginger, cardamom and a hint of cloves. It’s the perfect cookie to welcome in Autumn! Over the summer I spent a few weeks in Brooklyn shooting dozens of photos for the book, with faboo photographer Vanessa Rees and my buddy Terry, plus an assortment of other helpers (so many dishes!) It was a great time, spilling fabrics all over the floor to get the exact right napkin, arranging sprigs of cilantro just so, and wrapping noodles around forks. So I wanna’ share a little bit of the process here. This video tracks the life of a food photo; from picking out the background, to the lighting, to props, there is so much that goes into each shot before it gets to the page. Here you can see that we tried several different arrangements (Should the cookies be on the baking sheet? Parchment? Maybe a plate? With tea?) before settling on the final composition. I can’t wait to return to Brooklyn this winter for round 2. But for now…cookies! ~ Since we’re not weighing the flour, the consistency of dough can vary. If your dough seems excessively sticky (like, it’s difficult to roll into balls that hold their shape and it’s sticking to your hands), then an extra tablespoon of flour or two gently kneaded into the batter oughtta’ fix it. ~ If you are the type to make cookies on a weekly (daily?) basis, it might be worth it to invest in a cookie disher. It’s basically a smaller ice cream scoop, but it ensures that the cookies come out uniformly sized. ~ For a lower fat cookie, replace 1/4 cup of the oil with 1/4 cup unsweetened applesauce. The cookie will come out a bit softer and puffier, but still amazingly delish! ~For people who said that they had problems with sticky dough, try washing your hands and make sure they’re very clean and a bit damp. That will help insure that the dough doesn’t stick. things i have been waiting for: this. I’m making these as soon as I get home from work. I’m so inappropriately excited! My boyfriend introduced me to chai tea lattes and Ive been obsessed with the taste ever since. Cant wait to make these for us and maybe a nice batch of lattes to boot. I might subsitute the cardamom with nutmeg since i dont have any…but who knows…maybe I’l splurge and buy a new spice for such a potentially addicting cookie. An over-used phrase, but OMG! I love ANYTHING chai, so I CAN NOT WAIT TO MAKE THESE COOKIES! Thank you so much! Can I engage in a marriage or civil union with a dessert? If so, yes, please. Yes! My husband loves chai everything and my stepson is a snickerdoodle fanatic- these are going to be a huge hit in our house! nice recipe, but especially nice to see how the arrangement took shape. I think i really fall short with my artistic side for our food-photos’. Better if it’s dessert, but if it’s a main that we’re eating then, forget it, I’m just way too impatient. Must think more and get creative in that department. Thanks. This is the perfect recipe for my college vegan co-op!! I am the designated “tasty things” maker for the semester, and we have to adhere to certain food policies, including no saturated fats (i.e. margarine), and no processed sugar, so the fact that this doesn’t call for either, using instead canola oil and maple syrup (our primary sweetener) delights me!! I can’t wait to make 8 dozen of these for all my co-op buddies! Oh my goodness. Don’t mind if I do! Yummm! I have seen a lot of great fall recipe’s lately. But, chai snickerdoodles?? I need to make this immediately. Such a great recipe! What is non dairy milk? Hi Delores, try something like Soy Or Rice or Almond milk. @Jenn: If you sub nutmeg for cardamom it’ll taste a lot like pumpkin pie. Also a good idea. I could watch videos like this all day long. Is that weird? hah. Love it. The cookies sound & look amazing as always! Just made these and they’re yummy! I didn’t have any cardamom so I just added a little extra ginger and cinnamon and a dash of nutmeg. Now, I can cook dinner! Yes please! I need more cardamom in my life. Making these tonight! 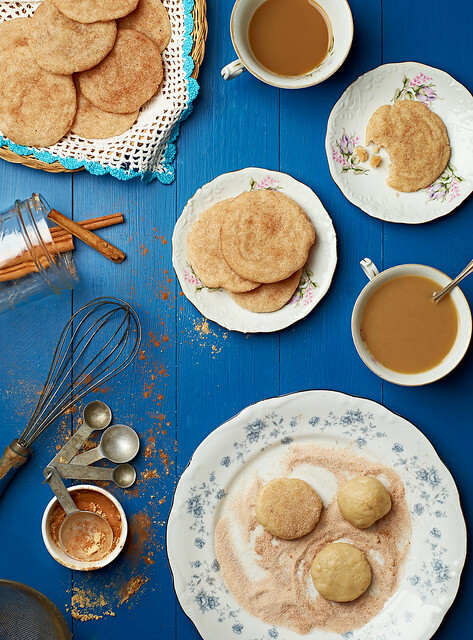 I’m a huge fan of Chai…what a great addition to snickerdoodles! And, they are amazing :) I somehow ended up with 3 dozen, but I’m not complaining. Weird! Cookies are a mystery. These look great! Although I suspect I will reduce the sugar – I usually end up doing that with your dessert recipes (and most other dessert recipes, for that matter) because I like things a little less sweet. BTW, my favourite snickerdoodle variation is a chocolate ginger one, which is based on your Mexican hot chocolate ones: instead of cinnamon and cayenne, I add 1/2 teaspoon ginger – and then after mixing everything else together, i fold in half a cup of chopped candied ginger. (Note that you really do need to reduce the sugar if you do it that way, because you’re adding a bunch more with the candied ginger!) SO GOOD. Yes, you can totally get away with reducing the sugar here, especially because they tops are dipped in sugar. I bet even 1/2 cup would be kosher. Wow! ISA, do you think I could sub the sugar and maple for agave syrup and apple sauce? I am trying to avoid sugar at the mo as am goin thru a hard time and it sets me off crazy! These look amazing and I don’t wanna miss out! What a fab idea to use chai spices in food. Genius. Well, the tops are dipped in sugar. What about something like sucanat? Agave will make things pretty cakey. September 28, 2012 at 3:14 pm: Sara D.
Made these last night and they’re delicious! I brought them to work and everybody agrees with me. That was fast! Glad you liked them. I’m so happy to see you finally posting a gain, I’ve missed you! Def making these cookies tonight, also wondering if you’re doing vegan mofo? Its my first year doing it, so im super excited! Cookies are awesome.Cardamom freak that I am, I added some to the batter (in addition to the cinnamon). If you really like cardamom, too, buy the green pods and shell/grind them yourself. It’s quite labor-intensive, but once ground, cardamom loses its flavor very quickly. I try to use mine within a week. These are definitely going to get made at our house. My son LOVES snickerdoodle cookies! I don’t know what I did! These were impossible to get off my hands! I tried adding more flour, but it was a total mess. Does anyone have any idea what I could have done? I’m going to change the recipe to 3 tablespoons milk, so hopefully that takes care of it! It’s weird, because in testing, the cookies were to dry for some, so I changed it, but 3 tbs is what works for me. If for some reason they are still too wet, a Tbs or 2 of flour should take care of it. Better wet batter then dry! I am a huge fan of your books and, particularly, the sister cookies to this new creation-the Mexican chocolate snicker doodle. These chai ones are in my oven now…3 minutes to go. I made these for my three teenagers yesterday and they all loved them – and now the oldest one wants to bake them himself. I was so tickled! Thank you! I was so excited to see these and couldn’t wait to give them a try. But the dough never quite got there for me and the end result was a little disappointing. I kept adding little scoops of extra flour, hoping to get it to resemble the Mex Hot Choc ones that I **LOVE** but alas that never happened and I still don’t know why it never really firmed up… Did anyone else encounter this problem? I made these with 1/4 oil and no applesauce, but the milk remained at 1/4c. The dough was easy to handle with a scooper, but at 12 minutes they were underbaked out of my oven. Tasty nevertheless. I didn’t have all the spices in the house but was feeling impatient so broke open a Chai teabag and mixed the contents with sugar for the topping (having done the same sort of thing with Earl Grey in cupcakes before). I can recommend it! YAY! My favorite cookie in vegan form! Couldn’t ask for more. Thank you! I can’t wait to make these! Mine were super sticky as well, taste delicious however! I may or may not have licked the yummy dough off of my fingers…I will use less milk next time and maybe a bit more flour. They were a HUGE hit with my kids. I also got about 3 dozen cookies out of this batch. I just made these now. Delish! They are so…buttery or something. I made these and had to add LOTS of extra flour – did I do something wrong? the dough was very runny before I added more flour. The flavor of the cookie was not has good as the recipe for your regular snickerdoodle recipe in your vegan cookie cookbook, probably due to the 1 cup extra flour I added. Suggestions? I loved the chai topping and will use it again on your other cookie recipe! DUDES! I wonder if chilling the dough for a bit will remedy this sticky sitch?? Hi Isa, I love all of your stuff and have great luck with it. One question of interest, though, why *not* weigh flour? Many americans don’t have kitchen scales but I bet offering the weight in grams would be nice for us people who do want to get the exact same result you did. I served these at tea today because my friend and I needed a little pick-me-up. They were the star of the table; adorable, fluffy, fragrant and delicious. Next time I will try the applesauce version. Oh boy. These look wonderfully naughty! Any chance you might have a guideline for making them gluten-free? I’m a broke student who can’t afford to experiment. They sound like a dream. This photo makes me happy. I will be making the cookies soon- they sound perfect for Fall. i just used the recipe as a base for carob chip cookies (didnt have ginger and over was alreay on) and they turned out nicely! These were amazing. Brought them to a meeting and everyone loved them! No but seriously, delicious cookies. Yay! Another amazing recipe to try. Can’t wait! I made these last night and they are SUPER tasty! I brought them to work this morning and all my non-vegan coworkers raved about them, too. Note: I found I had to add about 3 tbsp more flour at the end because the dough was so sticky. These are amazing! Our favorite of yor cookie recipes so far, and we eat your cookies A LOT! The best part is how the house smelled while they were baking. Thank you! Has anyone made these gluten-free yet? If so, any tips? Thanks! Mmmm those sound super delicious. I can’t wait to try them. Think I can substitute the oil with something else in these? If so suggestions? Apple Sauce? Or?? Love, love your recipes! Made your thumbprint cookies from FOK Cookbook last week – they were amazing!! Oh – and…does flour have to be white? Would any more whole grainy types work? Spelt? Oat? Wheat Pastry? I know, I know they are cookies just eat them and love them but I am determined to make efforts (though pathetic at times) to make healthier yummy things! When, oh when, is your new book coming out? I’m having trouble waiting. Patience is not one of my virtues…..actually, don’t really know what a virtue is…hmmmm. Aw, thanks! It’s not out until next fall, 2013. Wow this looks so delicious I loved your Chai Cookies from your book! Chai is my favorite tea so I cant wait to try these! Thank you so much for this can’t wait to get your next Cookbook! these are awesome, seriously. i just made them and i usually don’t do this but i want to eat more than just half as a tester… THEY ARE SO GOOD. i’m not going to tell anyone they’re vegan until they are like “omfg best cookie of my LIFE” haha. how do you do it? What flour do you think is best for this recipe? All purpose? Whole wheat pastry flour? Any suggestions? Hmmm… the dough wouldn’t come together for me at all– was a sticky mess even after 20 minutes in the fridge AND an extra 1/2 cup flour… I just ended up scooping them with a cookie disher (mini ice cream scooper) and sprinkled the spices on the top of each one. these are wonderful!! thank you so much for the recipe! Can I use agave instead of maple? Maybe reduce the amount of agave. Please advice! Thanks for posting this. The chai topping on the cookies was delicious. I substituted half the oil with applesauce and put in half the amount of sugar in the cookie batter and I had the sticky dough problem as well. I ended up adding more flour and making them “drop” cookies because they were too sticky to try to shape. Like someone else posted, I think adding extra dough took away from the flavor of the cookie. Maybe my modifications caused the problem with the dough. I added this to the recipe “For people who said that they had problems with sticky dough, try washing your hands and make sure they’re very clean and a bit damp. That will help insure that the dough doesn’t stick.” I think that will help! These look fantastic! I’ll have to try them over Thanksgiving break. Do you have any tips for experimenting with veganizing non-vegan cookie recipes? Made these recently and they turned out SO well. I already love snickerdoodles, so these were a fun, fall-ish twist. Thanks for sharing the recipe! MMMM I made these yesterday and my hubs and I ate them all. Perfectly sweet and spicy! I did have to add a pawful of flour to make the dough and then I chilled it in the fridge so it wasn’t sticky. Perfect crisp-chewy cookies. Thank you Isa! I haven’t made these yet (oven broken) but I see there is no refrigerator time like your City Girl Snickerdoodles. I had to refrigerate those for at least the recommended time to get the dough not to completely thin out during the baking process. Also the pistachio rosewater cookies didn’t say to refrigerate the dough so I didn’t and got super thin cookies as well. So…..do you think refrigerating the dough would help with that? I made these over the weekend, making all the calorie/sugar cutting cuts I could: used the apple sauce like you recommended, instead of one cup of sugar in the cookies, I used half a cup of sugar and half a cup of Xyla. The taste was SPOT ON!!! Delicious! This was my first time baking cookies on parchment paper so I think I should have baked them a little longer to get a crisper bottom. I didn’t even use all the chai flavored sugar for the topping. Next time I’ll pour out maybe an 1/8th cup of sugar. Hi Isa, I think I have the answer to the frustrating stickiness of this batter ( even after adding 3 tbsp of flour to the batter). It’s much easier to handle after refrigerating for 10 minutes. They’re delicious! i just cooked these in a waffle-maker and they were brilliant. Highly recommended. Also, making them into ice-cream sandwiches is also terrific. I have made these cookies for two events and they were terrific both times. I did not have any problem with the dough being sticky because I made sure my hands were damp as I rolled it into shape. It is helpful to have a small bowl of water handy to periodically dip your fingers into while you roll out the cookies. Also, I used only half of the topping for the first batch so I saved it in a tupperware and it was all ready for me when I made these again. Thanks for the wonderful recipe it is easy and the cookies are delicious. Just pulled the last dozen from the oven and few minutes later, my teenage daughter came home starving from ballet practice. After quickly eating half of one of the warm ones, she said, “I gotta get some almond milk out and dip this guy in there; they’d be perfect together.” And after watching her eat three or four more, I guess she was right. What a delicious cookie for a cool autumn day. When is your new beautifully photographed cookbook coming out? 2013? Winter? Spring? I have Rees’s ice cream sundae as my kitchen iPad screensaver. Can’t wait to see what you both create together. ooh I’m making these. The chai cupcakes are my go to cupcakes. These look so amazing. These were amazing. I haven’t really ever baked and these were super easy to make and tasted just wonderful. I didn’t have any vanilla so used extra maple syrup. I didn’t have any cardamom so I used nutmeg and cinnamon. Fantastic! Just made 12 doz of these for a school function and they are delicious! They smell absolutely heavenly when baking. I didn’t have any problems with the texture of the dough–easy rolling and flattening. Deliciously chewy when warm and deliciously crispy when cool. Will definitely be making more for the family over the holidays. Thanks! I made these for work (friendliest local grocery store in Portland) and my co-workers LOVED them. I baked 4 batches, no problem with stickiness as I chilled the dough first. The cookies “vanished” in under 2 hours. Thank you for such a wonderful idea! Just made a double batch of these, subbing corn syrup for maple syrup because it was what I had, and they’re PERFECT – no stickiness, no trouble handling the dough.Since I started eating 5-6 small meals a day to keep my blood sugar level even, I’m rarely tempted to eat more than one or MAYBE two cookies, but it’s taking all my willpower right now not to inhale a dozen or so. Really delicious. I had ben eyeballing this recipe since it came out and finally made it over Thanksgiving weekend. I ended up making three batches because everybody wanted more of them. For the kabillionth time, your recipes have not let me down! Thanks so much! Side Note: I also chilled the dough but I chill the dough for every different kind of cookie half an hour before baking. I once read on a blog that if you don’t take the time to chill then you don’t deserve perfect cookies. Since I started chilling dough I have never once had a cookie not turn out perfect. WORST FOOD EVER!!! NEVER EAT IT IN YOUR LIFE, UNLESS YOU WANT TO DIE!!!! My batter was not sticky at all. In fact, the opposite. Cookies turned out crisp not chewy. But! I will try again. Next time adding to the batter! this was delicious! thanks so much. Isa, I have this question: I really liked the Mexican chocolate snickerdoodles recipe, and would like to give away a cookie jar mix with those. My problem is, how do I go about that? I mean, the recipe for your Punk Rock Cookie Jar is different from the Mexican Snickerdoodles one. What kind of modifications do I need to make for the recipe in that case? These are so good! I weighed my flour (10 oz) and had no problems. I didn’t need more flour or liquid. They’re crispy on the outside and chewy on the inside. Pure perfection! Made these tonight and they are delicious. Perfect texture! The only thing I’ll change next time is adding even more spice. will be making them very, very soon for winter. I tried these out today and made a half batch and they are absolutely DELICIOUS. I’m not vegan, but have been wanting to try out egg/dairy free recipes for friends and are above and beyond…one of my favorite cookies I’ve ever made, vegan or not! The only thing is that, although they’re delightfully chewy / have great texture, they spread more than I expected, so I’m going to try substituting some oil for applesauce as suggested in the notes. These are fabulous and really easy… definite crowd pleaser for all. I have made these probably six times, all successfully- I have subbed brown rice syrup and a touch of agave for the maple syrup and they turned out great (they were a bit more chewy but not in a weird or unpleasant way). My dad asked me to make these for him for his scotch club christmas party (this doesn’t sound like a real sentence, I know.) Thanks for everything, Isa! December 8, 2012 at 4:01 am: jenny g.
Just made these, and they disappeared. Just amazing and delicious. So, I’m not sure what I did here, but mine came out super-chewy. They’re still good, don’t get me wrong, but is that supposed to happen? Hey nyc’rs! I am making these cookies using the “spicy aromatic tea-masala” spice blend for chai from Kalustuyans in curry hill (for the topping). It also has pepper in it as well as what’s called for, but just a touch. Could be fun. I tried both low fat and regular fat…go full fat! So much better.. I also used only 3/4 cup sugar in the full fat version, seemed to work well. Sweet like a cookie, but not cloying. Finally, only baked for 8 min since my rack was so low. Good luck y’all! And thanks for such a delish recipe, will be sharing for sure. These are the BEST! My new favorite cookie! December 17, 2012 at 9:29 pm: Katie R.
It was my first time making vegan cookies and they came out Amazing!! I also made the Double Chocolate Pecan cookies…soo good! Thanks!!! I’ve made these like once a week (…or more..) since I decided to try them the first time. So amazing! And conveniently don’t require margarine. Yay! maybe this is a silly question, but is the cardamom absolutely necessary? I don’t have any in the kitchen….any suggestions for a substitution? Or maybe I should just amp up the other spices? Thanks! These are amazing. I made them with coconut oil instead of canola, and it gave them a really nice little hint of coconut taste. I did one pan with the dough at room temperature and one refrigerated – the refrigerated ones came out flat and crunchy while the room temperature ones spread nicely and were crispy on the edges and chewy in the middle – perfect! WOW just made these w gluten free flour and AMAZING, the only struggle is the sticky batter… But added more flour and they came out great! I used rice milk “egg nog” for the milk and cut the maple syrup in half. They were delicious! December 22, 2012 at 9:18 pm: AllisonI. These are incredible. They magically taste like butter! They’re also pretty. I’m giving them as gifts but will make them again for myself. The PPK can do no wrong. I had a lot of trouble with the texture of these. For the first batch, I followed the recipe exactly, and they were very thin, hard, and chewy. They also stuck to the parchment paper like you wouldn’t believe, and most of the cookies were ruined because the paper stuck to the cookies and I couldn’t get it off. I tried it again with the applesauce, and the texture was much better – they were fluffy and soft, and they still held together well. I also just used a greased cookie sheet instead of the parchment paper, and the cookies came off the cookie sheet easily. They don’t need to be in the oven as long when you do the applesauce version – I only had mine in about 9 minutes max. The dough is extremely sticky no matter what you do. I tried having my hands “damp” but was honestly rewashing my hands for every cookie. Your hands need to basically be wet. This was my VERY FIRST batch of veganlicous cookies ever and I think I’m just gonna eat cookies all the time now. First batch came out super crunchy and they are now called “Crunchy Snicks”, because they’re still awesome. I cooked them for a little more than 12 minutes. I made these and they were super yummy but then they got really hard a day later. Would adding applesauce keep these sugar yums from hardening up? I’m pretty sure I just ruined these cookies by using wax paper rather than parchment paper! The bottoms of the cookies all stuck the paper. I was wondering why the oven was smoking so much… oh well! You win some you lose some. On the upside they taste great, but super sweet! Maybe I’ll use less sugar next time. Has anyone tried these at high altitude? I want to give them a go but am not sure they’ll do at 6,000 ft…. So wait, do you use the same amount of flour as the mexican hot chocolate recipe? Some examples: soy milk, almond milk, rice milk. Thank you so much for making your daughter in-law feel at home, that is very sweet. isa is the cookie dough freezable? or the cookies themselves? I am pretty sure that all vegan cookie doughs freeze well, but I haven’t frozen this one. Same for the cookies! I’m not vegan but I wanted to make some cookies for my friend who is. HOLY HELL THESE ARE GOOD. What an excellent recipe. Thanks!! I just made these with gluten free flour and they turned out delicious!!! I made some chai tea with coconut milk and dipped them in it and it was amazing. I made these today for Easter and everyone loved them! Thank you so much for the recipe! My only suggestion- don’t be afraid to add flour vigorously if you are dealing with sticky dough. With a little extra flour, these came out so marvelously! I couldn’t eat just one. I made these the other day. They are INSANE. Made some of these the other night! Didn’t have cardamom or cloves, so they were not chai spice. but they were the best snickerdoodles I’ve ever had! and the first vegan ones. Love this recipe. Thanks! I didn’t have the funds to splurge on real maple syrup, so I substituted 2 tsps of molasses and a little less than 1/4 cup of brown sugar for the maple syrup. I used 1/4 cup apple sauce and 1/4 cup canola oil instead of the full amount of oil… the cookies came out great, but didn’t crack and spread like traditional snickerdoodles. Flavor-wise I think they could have used a little more sweetness, in the future I’d up the amount of brown sugar. I had no problem with sticky batter, I followed other commenters’ advice and refrigerated the dough for 10 minutes after mixing… Good luck, these cookies are yummy and chewy and healthy! Just made these cookies and were excellent! I made it using the applesauce with less oil and did use 3 tbs of flour. I found the dough to be sticky and used her tip using damp hands which helped a lot. I will be making these cookies again and again. This is a great recipe. I made this 4 times in the past 2 weeks in anticipation of making it for my brother, son, and daughter-in-law. I finally found a solution that worked. I bought dried shitake mushrooms and dried wakame seaweed. I poured boiling hot water over the mushrooms and seaweed (use a bunch) in the same container, covering everything with an extra 5 inches on top and closed the container. I let that sit until the mushrooms were fully hydrated. The resulting water tastes like the ocean and this makes the mushroom taste the same way. Now the seafood flavor fully penetrates the mushrooms so they do taste like clams. Instead of cubing them I slices them and then cut them in shorter pieces so they looked more like clams. Instead of using vegetable broth, I used the mushroom soaking juice and added vegetable bouillon cubes. I separated out the re-hydrated wakame first and put it in the blender with a little of the juice for about 2 seconds. This created little pieces of seafood and when added to the soup the little green flecks in the mix look like kale. You don’t distinguish the taste of the seaweed since the entire dish tastes like the ocean. With this method, the resulting soup had a distinct seafood taste. Everyone thought I had prepared a non-vegan main course for them. They were really surprised at the vegan reveal. Made these this afternoon, they were gone by evening. Boom! Yeah they are that good. Could I sub coconut oil for canola oil? Warning: these are HIGHLY addictive! I substituted coconut oil for canola oil and doubled the salt. I wound up tripling the recipe because I decided I needed to bring them to work tomorrow and share the deliciousness with my office as well. Hi. I followed the recipe exactly and these are amazingly delicious but very hard. Do you think my oven is too hot or is there something I can add/change proportions of/etc. to make them chewier? I would very much like to incorporate pumpkin into these cookies. How might I go about that? ? These were delicious! I made them for an office holiday party and they were devoured. As usual, my colleagues could not get over they fact that they were “vegan.” Ha ha… they’ll learn soon enough! These turned out great! I modified the recipe so my diabetic MIL could eat it by using coconut sugar instead of cane sugar and sugar-free pancake syrup instead of maple syrup. I also used only cinnamon. The cookies were a hit at both holiday dinners I attended! So delicious! I can’t believe that these simple ingredients can made something that tastes like the non-vegan version! I am so happy, thank you so much! Just for anyone out there wondering, I did a very slightly varied recipe:I used coconut oil instead (simply because that’s all I had!) and I didn’t have cardamom so I used a little more cinnamon and 1/4 teaspoon nutmeg. It made the “chai” taste very subtle which I loved! These cookies are absolutely fabulous!! I ve been vegetarian over 20 years and have recently transitioned to vegan and I just wanted to say thank you for an awesome cookbook! Thanks for making it easy to save animals lives through veganism! I think I’m in love! 2 of these cookies + Trader Joe’s vanilla soy ice cream = one heavenly ice cream sandwich!! These were soft out of the oven and then 10 minutes later became ROCK HARD. I cooked them until they were brown on the bottom – 12 minutes. Disappointing. My teeth feel like they are breaking when I eat them. Which flour do I use for softest cookie? My 5y/o son tried these for the first time today. He heard the word snickerdoodles and was amused so I made these. They came out so well that he said, “Mama, can we have snickerdoodles every day all of the time?” Brilliant recipe again. My dough seemed soft, it’s quite humid here, but they worked out perfectly. I just flopped them through the sugar (I did both sides due to the blobbiness) and voila! Made half and half of dough is in fridge solidifying. I did omit ginger and cardamom (which I am anxious to try) for a more traditional snickerdoodle in honor of his first ever experience with them. I’ve made these twice now, and they are one of my favorite cookies of all time! I learned not to overbake or they will come out hard, but still delicious. If I hadn’t made them myself, I’d be convinced that they had butter in them–maybe it’s the maple syrup that gives them such a rich flavor? I’m helping supply some cookies today for meals for homeless people, and they are going to feel very blessed when they bite into these! WOW! If I wouldn’t have made them myself, I would have SWORN butter was used in this recipe! Tastes just like the ones I used to make with butter. I gave one of these to non-vegan friend and her exact words were “Oh my god, this is so good. This cookie is amazing. I want 10,000 more of these. I WANT TO DIE FROM THESE COOKIE!” Another friend told me it was the bast snickerdoodle she’s ever had, and two other people asked for the recipe. I used coconut oil instead of canola, and I didn’t have all of the spices so I used some Chinese five spice plus some more cinnamon and ginger. They are really amazing! Could you replace the maple syrup with something like molasses? Could I use coconut sugar in replace? Or all maple syrup? Or maple sugar in place of sugar? LOVE Isa’s books! This will be a winner in our house . . . has anyone substituted olive oil or something other than canola oil? Thanks so much! Just made these for Christmas! Perfect! These are going to become a tradition in our house! For the topping, I would recommend using less than half of everything called for. I would also recommend using half the amount of oil and slightly more flour. I had the opposite problem than others: my dough was too dry. I refrigerated the dough overnight and added a few tablespoons of cold vodka. That did the trick. My cookies are on the crisp side, which may change as I’m storing them with some bread. Next time I’ll reduce the sugar, too. Many thanks for a new holiday option! Hi! Its a wonderful recipe. What can I replace maple syrup with, as it is not easily available in India. Kindly advise. Also just to clarify – instead of 1/2 cup oil should I use 1/4 cup oil and 1/4 cup unsweetened apple sauce? Thank you. I wonder if I did something wrong. I followed recipe exactly. The first sheet I didn’t flatten out very much, and they were dense/chewy with crispy bottoms. You could tell they had oil in them because it wasn’t a really good kind of chewy, almost like they didn’t rise enough or get fluffy enough. The second and third sheets I flattened them out a little more, but they became really crispy, kind of hard. How are they supposed to turn out. I loved the idea, but the cookies turned out kind of strange. They wouldn’t bake all the way through no matter how long I baked them, and they were yellow in the middle (from the oil, I’m guessing). They were fine coming out of the oven, but when set aside they instantly became stone-hard. Like, break-your-teeth hard. Still delicious, but it left me wondering what I did wrong! I followed the recipe exactly. These are impossible! I followed the recipe to the letter. I used unsweetened almond milk as my non-dairy milk. The dough never forms into a dough its just more of a goop. They come out flat as pancakes and chewy like caramel. When they cool they’re just hard disks. They also stick to the pan despite all of the oil in them I had to pry them off with the spatula. They smell good and the flavor is good but, this recipe needs work. I was looking for a vegetarian recipe for cookies for my Indian friends that will come over. I found your recipe and I am so happy I did, those are fabulous! I didn’t have vanilla extract and I was too bored to work with vanilla beans. I put some ground mastic in the dough, and a few more spices on the topping, and OH MY, these are to die for! Thanks so much! These cookies are the cure for most of life’s problems. I am allergic to eggs,milk,and wheat can I substitute the flour for coconut or rice flour and come up with the same results?